Have a comforting meal and a wonderful fall feast with this vegetarian sweet potato casserole. 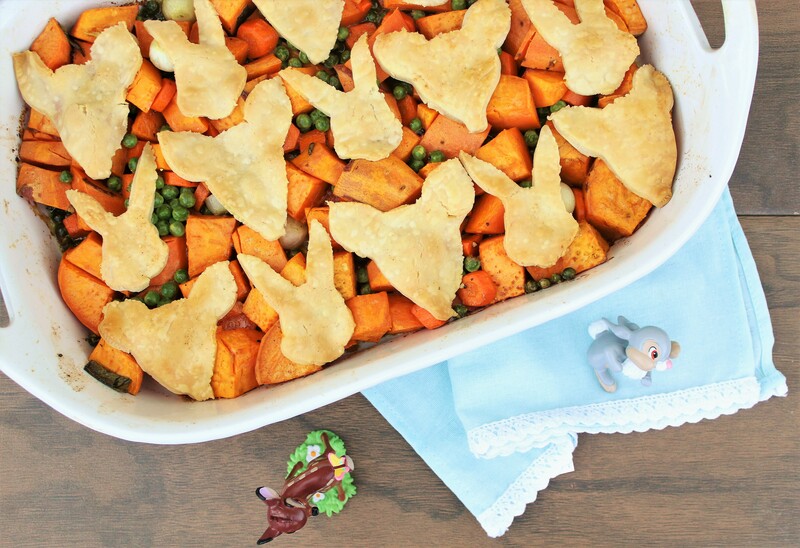 It’s savory with a little sweet, and a touch of Disney magic with the Bambi and Thumper-inspired pie crust cut outs! It is sure to be a fall recipe favorite, and is perfect for vegetarians on Thanksgiving! Peel and dice all of your veggies, and combine in a bowl. Pour your veggies into a casserole dish. Mix together your casserole dressing ingredients in a separate bowl, and set aside to allow the sage flavor to soak into the butter. Print out the Bambi inspired template, which you can download here. Cut out the Thumper and Bambi inspired silhouettes, and then on an un-rolled pre-made pie crust, use a toothpick to trace the shapes. Cut out 6 Bambi shapes and 6 Thumper shapes. Remove the sage leaves from your dressing, and then pour all of it over your casserole evenly, leaving about 1 Tbsp leftover in the bowl. Place your pie cut out shapes on top of the casserole, my dish fit about 15 shapes. Typical casserole dishes will fit 12-18 shapes. Using your remaining dressing, brush lightly onto the pie crust shapes.